Firefighter-EMTs Mike Bascom, Brandon Broach, Zachary Huber and Robert Ratcliff successfully completed Paramedic Training Tuesday 30-July. 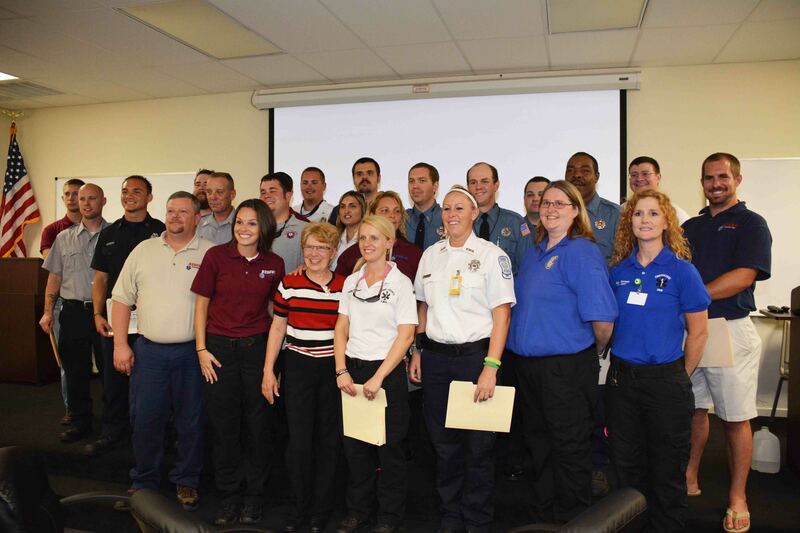 All four personnel graduated from Rescue Training in Savannah GA. The intense training course involves over 1200 hours of classroom and clinical training. Click here for additional information. An adult male received multiple traumatic injuries after being hit by a car in the 100 block of Peurifoy Road Monday morning, 29-July. The incident was reported at 05:55 after the man was struck, then thrown into the ditch. Firefighter-Paramedics found the man semi-conscious lying the mud. The accident occurred on a dark section of the of the road and the morning fog was heavy. Click here for more information. Firefighter-Paramedics responded to the 100 block of Risher Mountain Road Sunday morning 28-July, for a person shot. Units arrived to find multiple Law Enforcement officers from Colleton and Dorchester Counties at the scene. Crews were directed to a wooded area were they found an adult male who was deceased from multiple gunshot wounds. Click here for additional information. Incident 3 13-03985 – A seven year old girl received life threatening burns after another child accidently knocked a pot of boiling water on her at a residence on Woodmeadow Drive. The accident occurred Monday evening 22-July at 20:38 in the 400 block of Woodmeadow Drive. 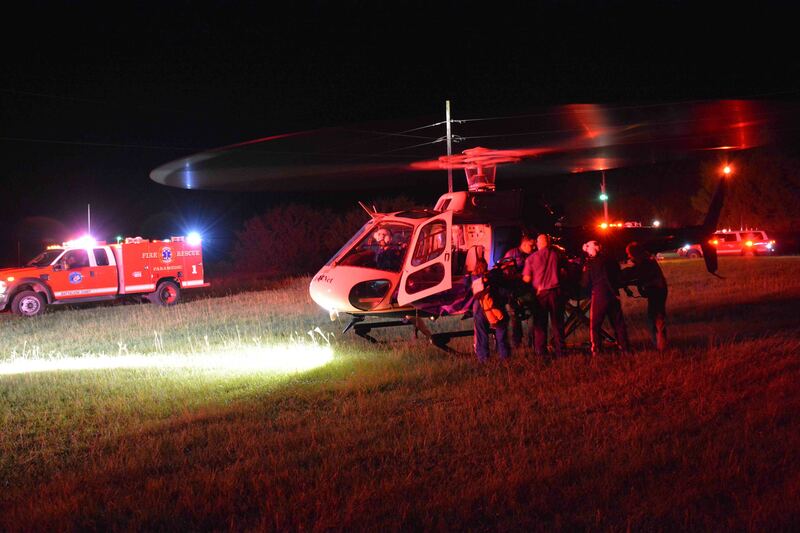 Firefighter-Paramedics found the child with first, second and third degree burns... click here for more information. 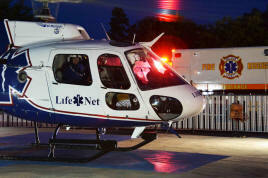 A 50 year old Cottageville man received critical head injuries in a motorcycle crash at the intersection of Peirce Road and McDanieltown Road, Sunday afternoon 21-July-2013. The incident was reported at 17:46 after the cyclist lost control and reported rolled several times. He was not wearing a helmet. Firefighter-Paramedics found the man unconscious with multiple traumatic injuries. Click here for more information. Fire-Rescue wishes to offer condolences to Firefighter Harold “Buzz” Buzzell on the death of his wife Nancy. Nancy passed away last night, 18-July at their summer home in New Hampshire. Their son-in-law is “A” Shift Battalion Chief Brent Dalton and their granddaughter Victoria serves as an Explorer with the department. Nancy has been ill for several years, but frequently responded with Buzz to emergencies. She generally remained in the POV, watching the personnel perform their duties and waiting for Buzz to return. The funeral will be Tuesday at 13:00 at Remick and Gendron Funeral Home, 811 Lafayette Rd, Hampton, NH 03842. 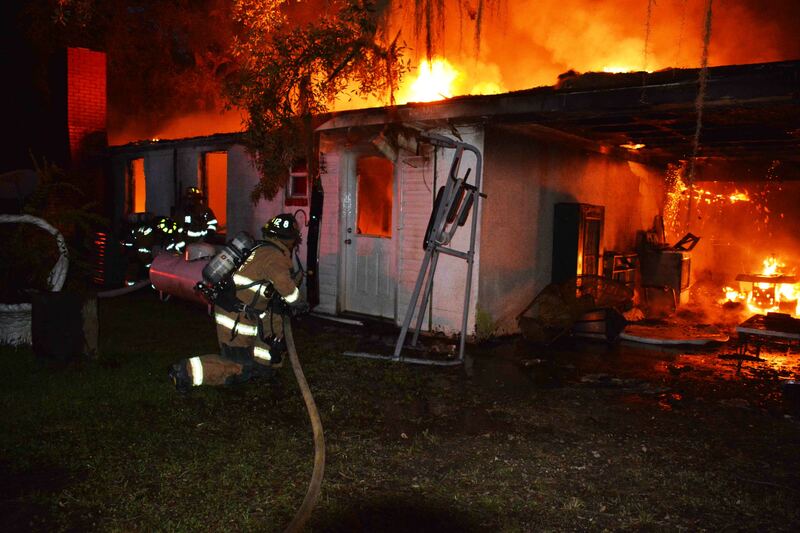 A single family dwelling received heavy damage in a late night fire at 3341 Ashton Road in the Islandton Community, western Colleton County. The incident was reported at 23:59 Thursday evening 17-July while eastside units were clearing up from a working fire near Cottageville. 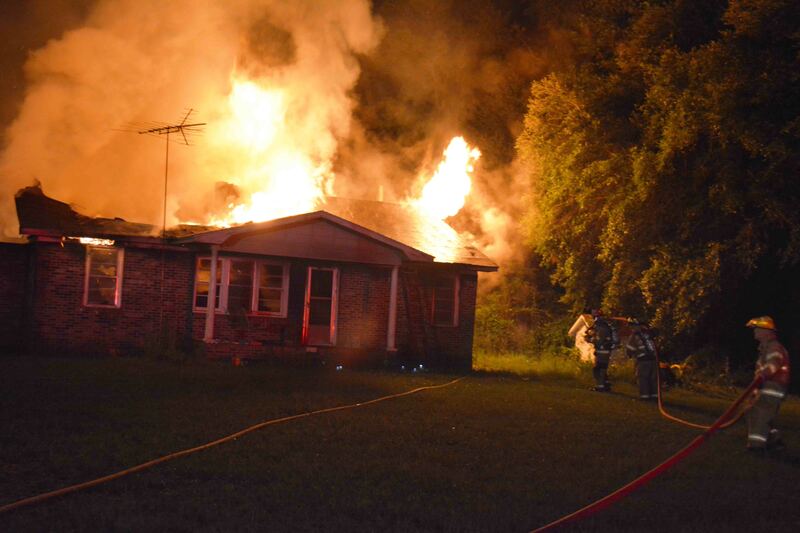 The original caller to 9-1-1 reported a man was trapped inside the burning structure... click here for more information. 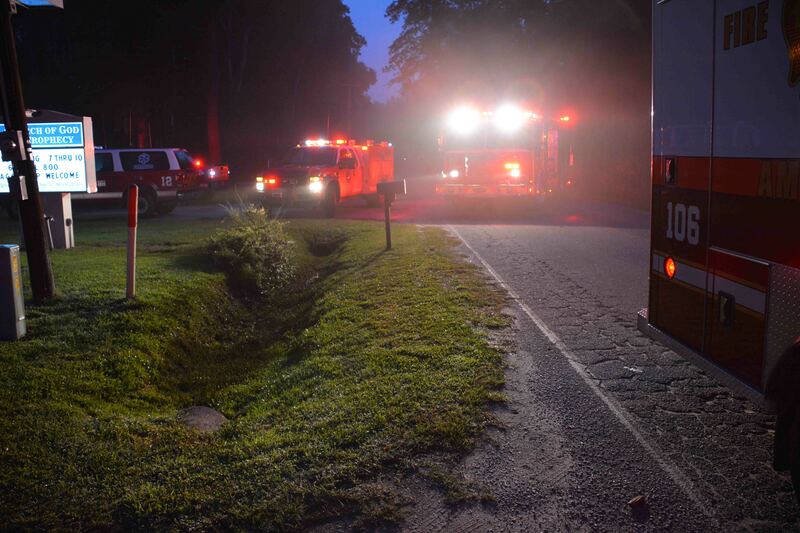 A curious motorist discovered a house fire Thursday evening east of Cottageville. The woman was traveling on Cottageville Highway (US Hwy 17-A) when she saw a thick column of black smoke coming from a wooded area, well off of the highway. She found a narrow dirt driveway and drove into the woods only to be stopped by a locked metal gate. Click here for additional information. The new crews at Fire Station # 13 have an unusual mascot. With the unseasonably rains in the Lowcountry over the past several months, the retention pond at the new station has remained full and over flowed into the low areas south of the station. 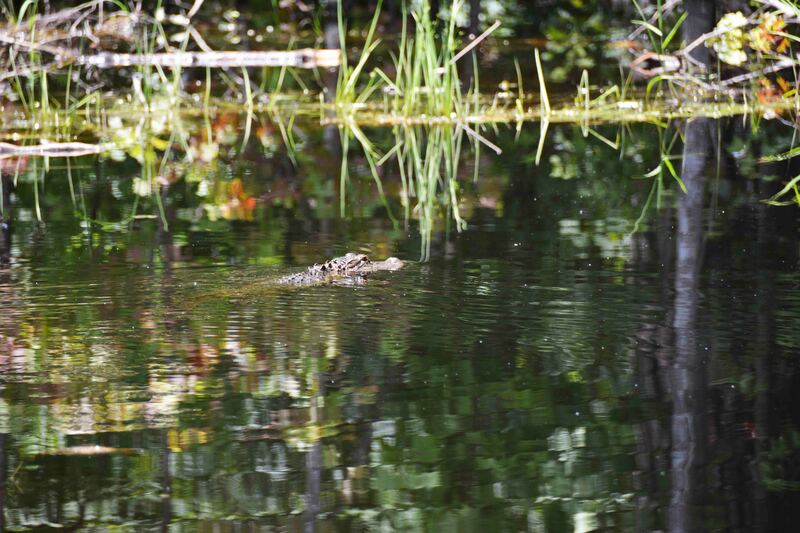 A four foot alligator has taken up residence in the retention pond, feeding on the numerous large frogs inhabiting the area. Click here for more information. 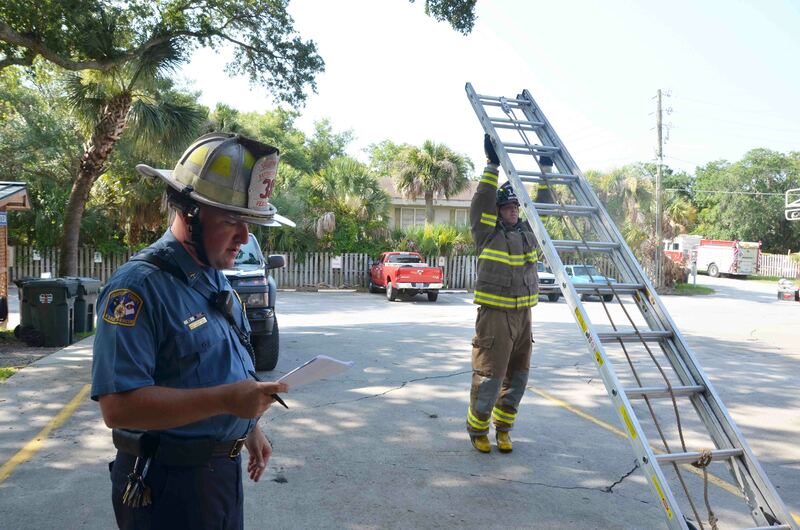 The Colleton County Fire-Rescue Training Division assisted the Town of Edisto Beach with Firefighter evaluations in the first weeks of July. The Town Administrator requested assistance to evaluate the Town’s full-time and part-time firefighters before the arrival of a new Fire Chief in September. Click here for additional information. The Lowcountry Fire & EMS Weekend will be held on November 9 & 10, 2013 at Station 19 (1118 Thunderbolt Drive, Walterboro, SC 29488). More information is available at www.lcfems.com. An adult male received a critical head injury following a domestic dispute Thursday morning 11-July at 01:36. 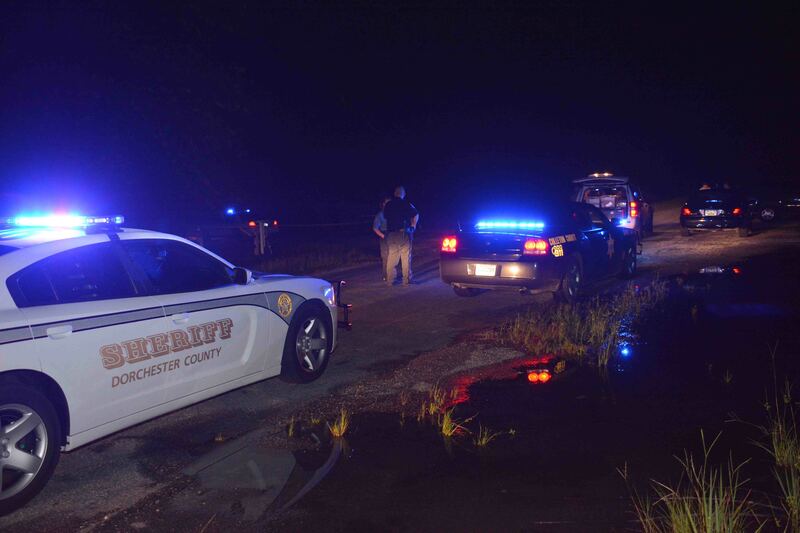 The incident occurred at 10422 Lowcountry Highway, south of Sniders Crossroads. Witnesses stated the man was struck in the head with a hammer. Firefighter-Paramedics found the man semi-conscious inside the residence and immediately requested a medical helicopter. Click here for more info. 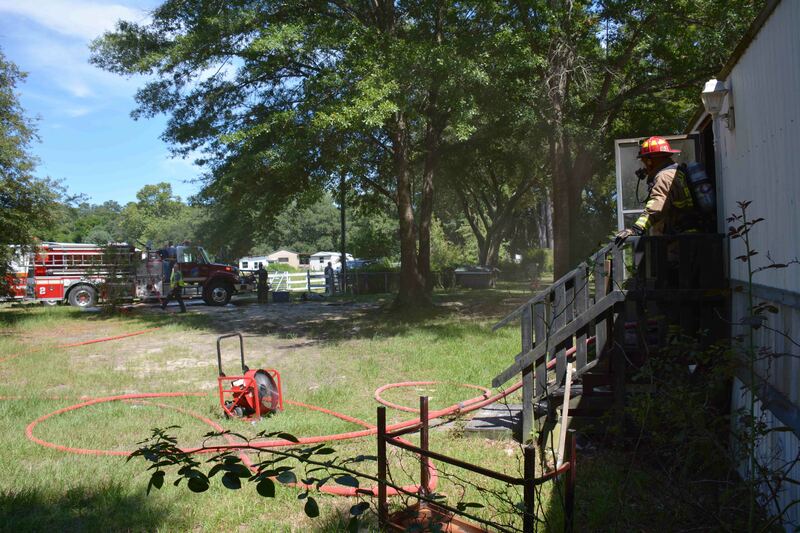 Firefighters made a quick stop on a residential fire Wednesday afternoon 10-July. At 15:02, a teenager who was cutting grass next door to 104 Cheshire Lane in Jacksonboro, noticed smoke coming the singlewide mobile home. He contacted 9-1-1. Station # 2, which is located only two blocks from the residence arrived within minutes to find smoke coming from the eaves of the building. Click here for additional information. At 20:55 Sunday evening 07-July, Station # 26 was dispatched to was believed to be a vehicle fire at 244 Remount Lane. On arrival, Engine 26 could see a large column of flames on the property but was confronted with a locked gate. 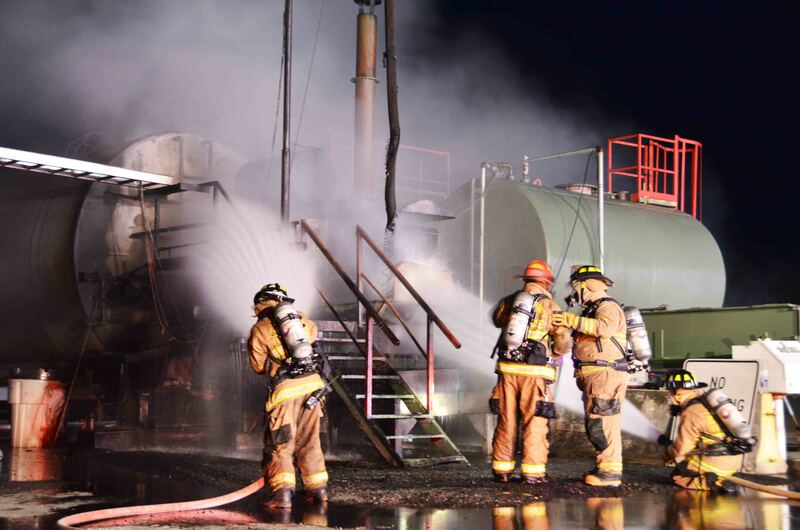 Firefighters used bolt cutters to breach the lock and found a large oil and asphalt tank burning at an asphalt plant located on the property. Click here for additional information. A high speed single car MVC resulted in the death of a 20 year old Ohio woman. 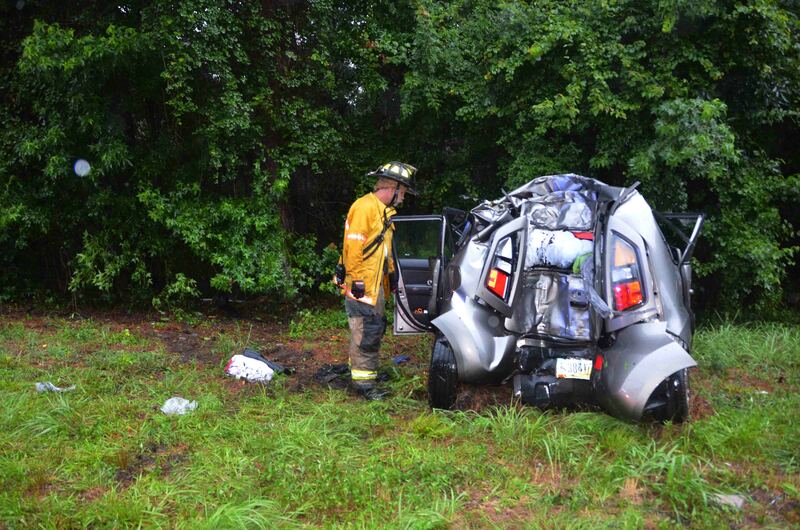 The accident was reported at 16:29, Monday 01-July on I-95 near the 64 mile marker northbound. It occurred during a thunderstorm which brought heavy rains to the area most of the afternoon and evening. A northbound KIA SST lost control, spun around backwards while entering the median and struck a large pine tree. Click here for more info. 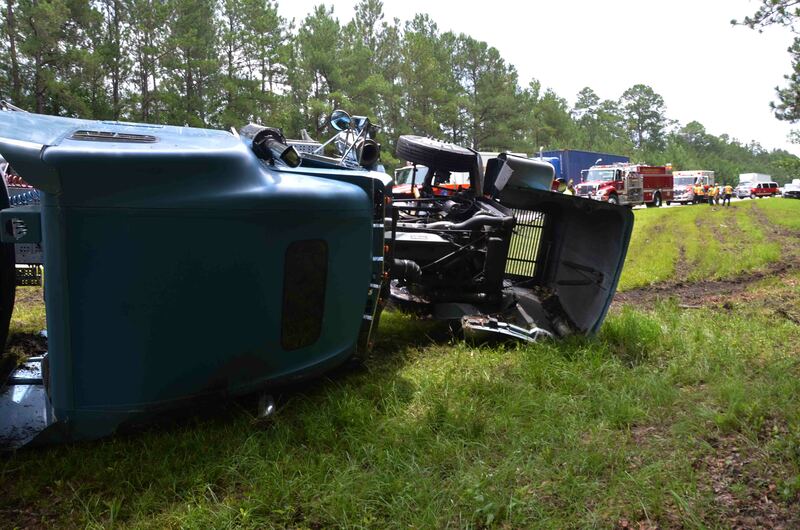 At 12:22 Monday afternoon 01-July, Fire-Rescue was notified of a multi-vehicle MVC on Interstate 95 near the 61 mile marker northbound. The caller reported several vehicles involved including a tractor trailer. Engine 26 arrived to find the northbound lanes stopped for half of a mile and eight damaged vehicles scattered about the scene including a tractor trailer truck on its side in the median. Click here for more info. 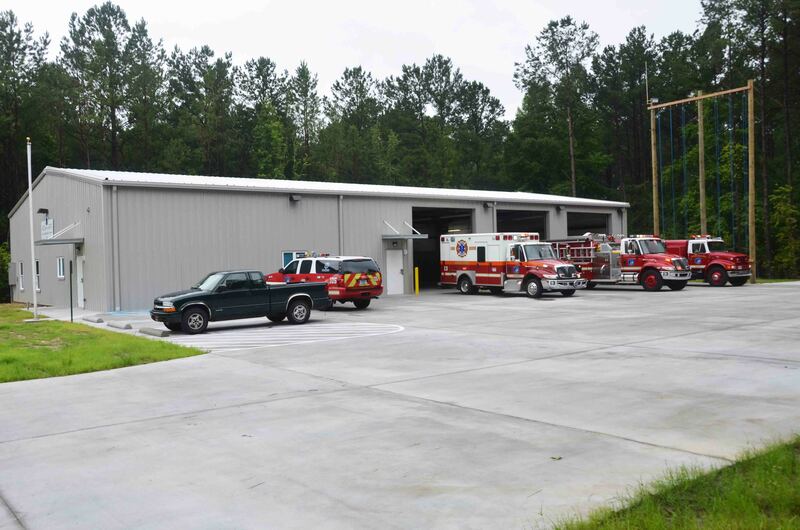 Fire-Rescue opened three new fire stations in June. Construction on the three projects began in late 2012. All three were constructed by local contractor IP Builders. Two of the stations are located in the northeastern areas of the county. 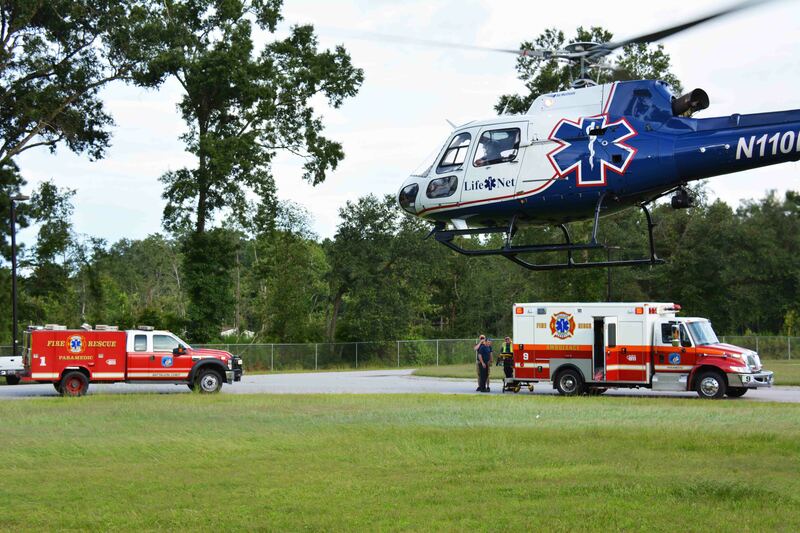 Station # 32 at 15238 Round O Road is in the Sidneys Community and will extend Class 4 insurance coverage to the Hiotts, Wesley Chapel, Sidneys... click here for more information.